THE STORY - The origins of the Colombian drug trade, as seen through eyes of an indigenous Wayuu family that becomes involved in the booming business of selling marijuana to American youth in the 1970s. When greed, passion and honor collide, a fratricidal war breaks out and puts their lives, culture and ancestral traditions at stake. THE GOOD - An indigenous gangster movie with dashes of magical realism that will prove more engaging and accessible to popular audiences than director Ciro Guerra’s “Embrace Of The Serpent.” Visually stunning cinematography. Carefully researched and beautifully executed worldbuilding that embraces native imagery and mythology. THE BAD - While more conventionally entertaining than “Embrace,” “Birds Of Passage” is still an art-house film that runs long and will not necessarily win over a crowd expecting the pacing of “The Godfather,” despite some parallels. Lead performances stunted by the film’s commitment to tragedy. ​​Ciro Guerra’s surreal invective of colonialism, the remarkable “Embrace Of The Serpent” gave Colombia its first nomination for Best Foreign Language film in 2015, after its debut at Cannes where it won the top prize of the Director’s Fortnight program. 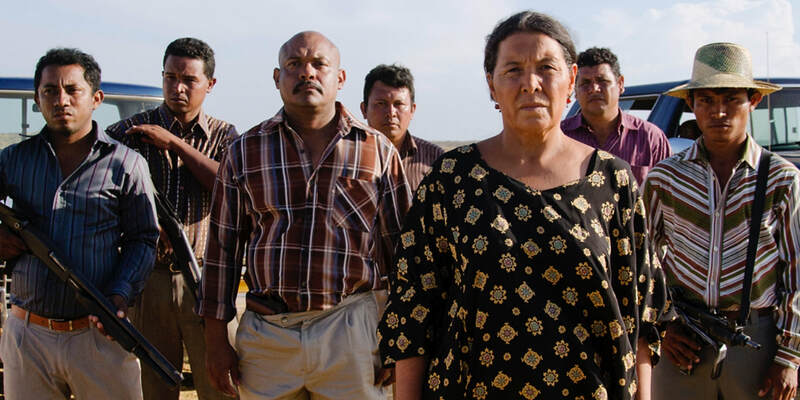 This time around, Guerra teams up with “Embrace” producer, Cristina Gallego, to co-direct another astonishing tale of Colombian history, “Birds Of Passage.” The opening film to this year’s Director’s Fortnight, and officially Colombia’s entry for Best Foreign Language picture, Guerra and Gallego’s latest collaboration can be best described as an indigenous gangster movie with dashes of magical realism. The result is perhaps not as visually intoxicating or unique of a film as its predecessor, but an altogether more accessible film, guided by a conventionally engaging narrative structure. But make no mistake, while “Birds Of Passage” is a violent crime thriller, it remains very much an art house film. Though this combination of sensibilities might extend an olive branch to those bogged down by “Embrace Of The Serpent’s” slow, deliberate exposition. The film follows Rapayet (José Acosta), an outlier member of the Wayyu tribe in northeast Colombia, as he builds a small empire providing increasingly large shipments of marijuana to gringo business partners he met after he and his alijuna (non-indigenous) friend Moeses successfully provide the hook-up for a young American peace corps volunteer. Rapayet initially turns to business with the gringos in order to make enough to pay for the extravagant dowry of a Wayyu woman, Zaida (Natalia Reyes), but Moeses’ unchecked greed and disregard for Wayyu tradition puts the duo’s business ventures at odds with custom, which functions here as law for the sprawling family network of Wayyu. Bloodshed at this crossroads is only the beginning. In the second act, a boy-member of Rapayet’s clan poisoned by corruption and wealth offends the leader of the other major clan, Rapayet’s supplier and cousin, Anibal (Juan Martinez), which ignites an all-out war between the two factions with catastrophic results. From the opening scene, in which Zaida, layered in scarves and beads, and donning a long, traditional skirt, performs a ceremonial “coming-out” dance for a crowd of Wayyu onlookers, “Birds Of Passage” is throughout gorgeously steeped in indigenous Colombian culture, a result of extensive research whose many details will likely go unnoticed by the average viewer. Regardless, this film is an achievement in world-building, much like “Embrace Of The Serpent,” but less anthropologically inclined, and more concerned with evoking symbols, sounds, and colors that will comprise the mythic dimensions of this Wayyu story. Particularly striking is the cinematography, which captures the isolation of the Wayyu way of life through dark and light contrasting shots-- headlights from the first automobile piercing through the stark black night, the smack of Rapayet’s white, modern compound against the endless backdrop of flat desert. Wayyu tradition is idiosyncratic, perhaps even contrary to reason, but it flows through the community as the shared understanding of what is right and wrong, the backbone of this society that when shattered, inevitably invites death and decay. The mixed cast of professional and non-professional actors deliver performances untainted by the melodramatic inclinations of your average crime thriller, thus contributing to the film’s authenticity. But an element of mystic foreboding and restraint dominates the mood, which simplifies or makes one-dimensional performances that could’ve been more emotionally dense. This is especially the case with Acosta’s depiction of our protagonist, Rapayet. While catering to a wider audience by committing to the “family gangster” genre exemplified by The Godfather trilogy, “Birds Of Passage” never flocks to familiar ground, offering a mystic, culturally specific take on the rise and fall of an indigenous family that is bursting with original imagery, and flora and fauna. With this entry, Guerro and Gallego establish themselves as collaborators to be reckoned with, perhaps two of the most significant South American filmmakers working today, alongside Argentina’s Lucretia Martel and Chile’s Sebastian Lelio and Pablo Larrain. Unlike these others, however, Guerro and Gallego tackle themes with revisionist intentions, a fully Colombian cinema that reckons with the country’s past, with the voice and by the movement of its indigenous cultures.